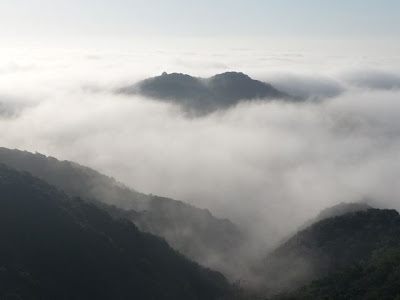 Los Angeles, along with the rest of coastal Southern California, experiences a unique weather pattern, known as "June gloom" http://en.wikipedia.org/wiki/June_Gloom. 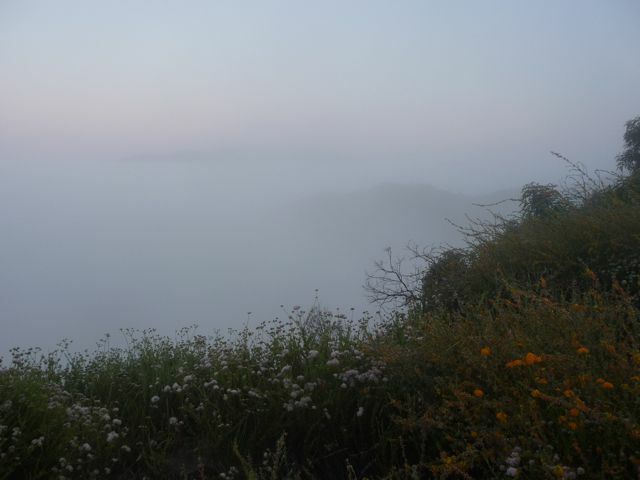 Throughout the spring and early summer, this means very thick low fog along the coastal regions. Ironically, coastal Southern California experiences more sunshine in January than June. There are several ways to deal with June gloom: ignore it, wait until around noon when it "burns off," drive inland away from the coast, or - perhaps the most interesting - get above it. 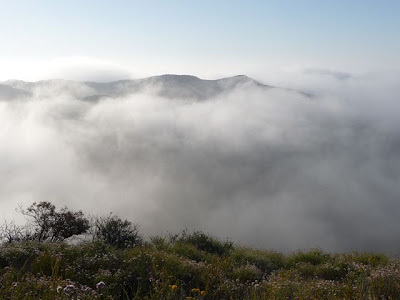 One of my favorite hikes in Los Angeles gets above it. 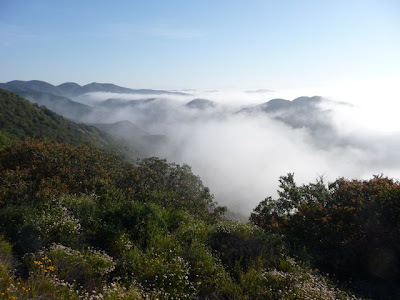 It's a fairly easy hike along the western ridge of upper Temescal Canyon, accessible from the top of the Palisades Highlands (in Pacific Palisades). 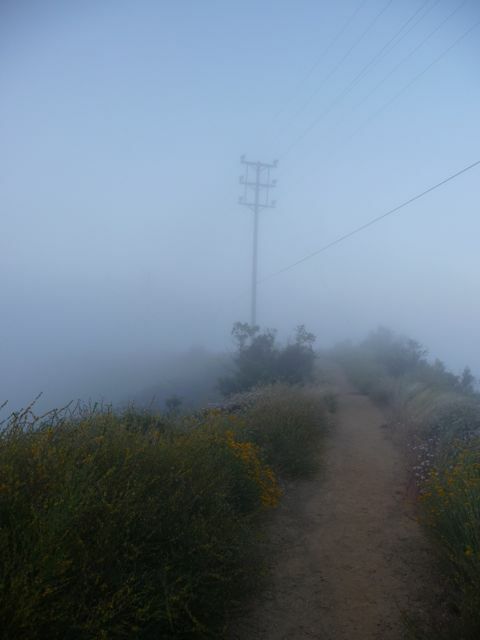 A recent hike, which started in thick fog, slowly gave way to hints of blue sky as I climbed a bit in elevation. 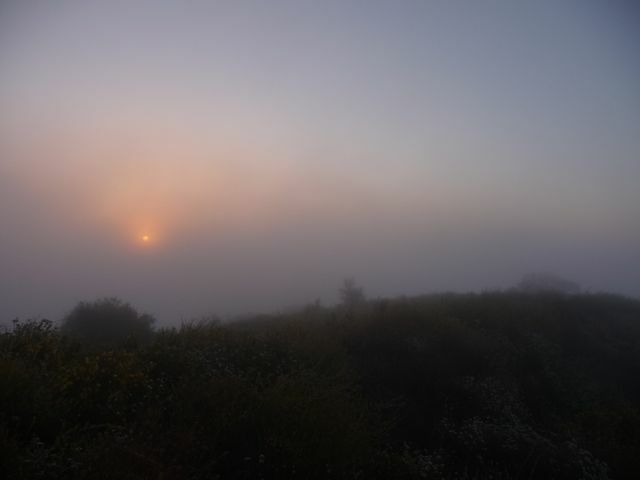 Sunrise through the edge of the fog a little before 6am. Pretty neat. More blue sky ahead. 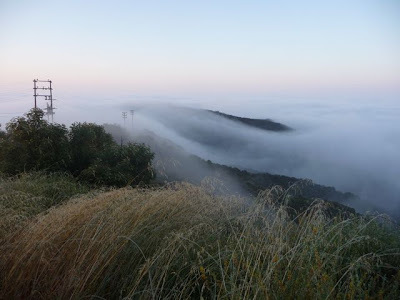 On this particular morning, the coastal fog topped off around 1600 feet. 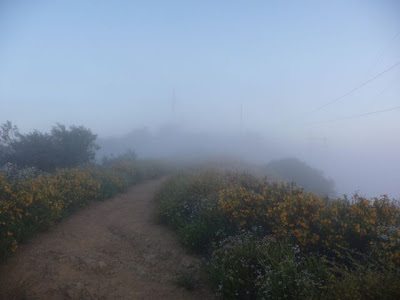 While the rest of Los Angeles was socked in, the peaks of the Santa Monica Mountains poked through, making for a great hike. 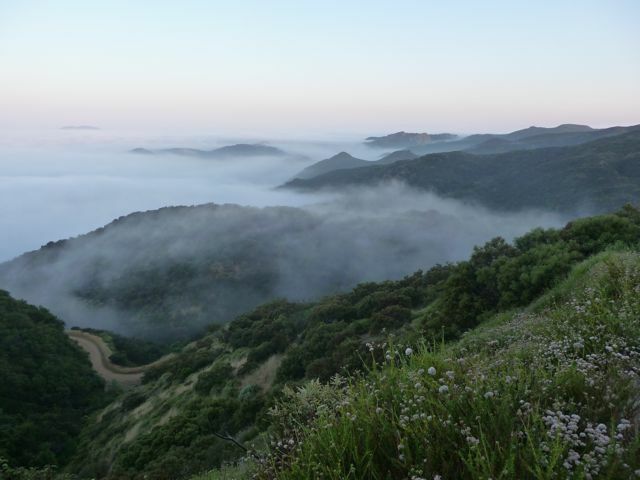 Turning around, the normally visible Santa Monica Bay and city of Los Angeles were blanketed in low coast fog. Looking northwest, fog up against the mountains of the upper Palisades Highlands and Topanga Canyon. 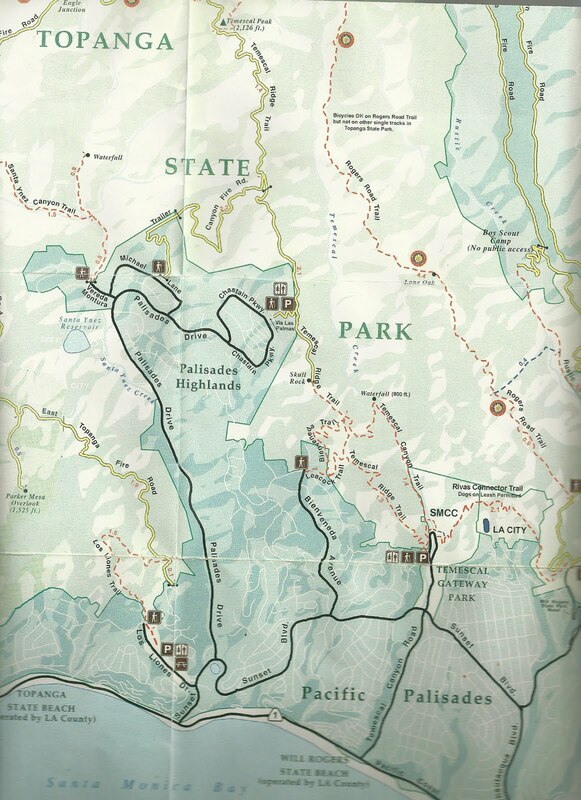 This entire area is part of the extensive Topanga State Park. 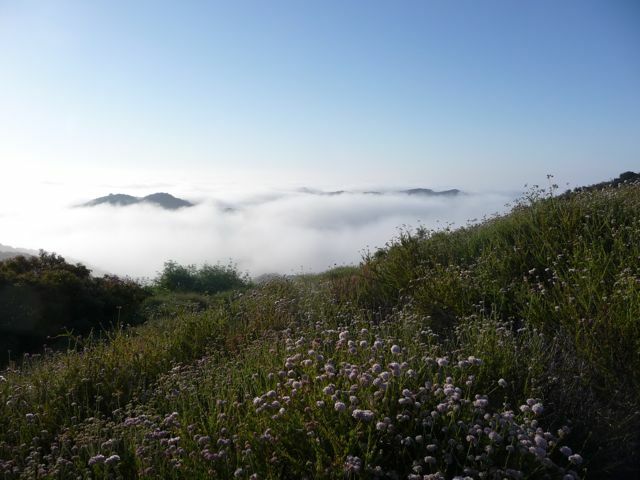 Here's a link to a previous post on Topanga State Park: http://www.ExperiencingLA.com/2009/04/topanga-state-park.html. Another view looking back towards the city. 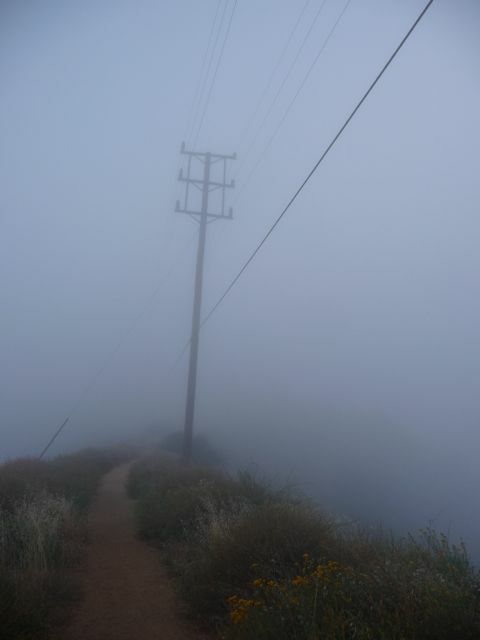 An slight ocean breeze caused the fog to literally pour up and over the ridge I was just on. I ended up walking another 30 minutes or so, to where the Temescal Ridge Trail connects with the Rogers Road Trail. If you're really ambitious can take this trail and either hike or mountain bike 5 1/2 miles south to Will Rogers State Historic Park. I opted for the easier route back to where I started. Heading back, the fog against the mountain peaks made for some pretty stellar views. Glad I had my camera. In previous blog posts, I've shared some thoughts on how the creation points to the Creator http://www.ExperiencingLA.com/2010/05sunset-north-of-sunset.html. This was definitely my experience on this hike. 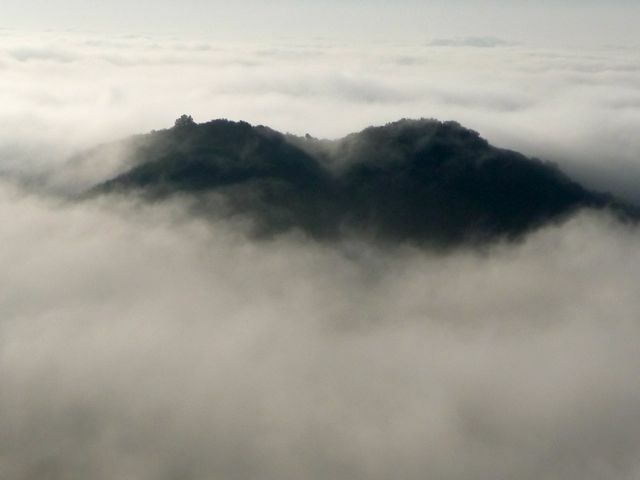 A mountain peak, guessing about 1800 feet, peaking though the fog. Bright morning sun and blue skies while the rest of coastal Los Angeles was still under a thick blanket of fog. Weird. No, this isn't a double exposure. 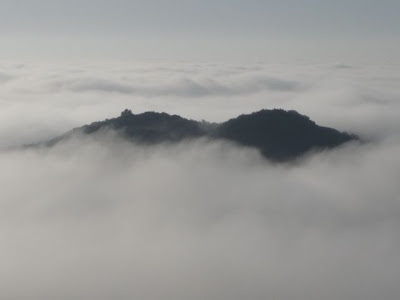 Just fog surrounding the same peak on the eastern ridge of upper Temescal Canyon. This entire area is within Los Angeles city limits. I've often hiked this ridge with a group of guys from my church. Amazingly, we rarely - if ever - see anyone else on this trail. 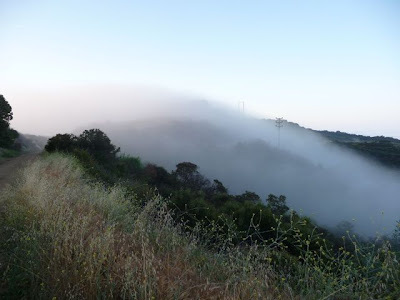 I headed back into the fog, and to my car. 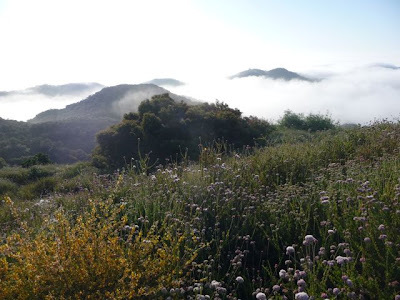 I would definitely recommend a hike along the western ridge of upper Temescal Canyon. 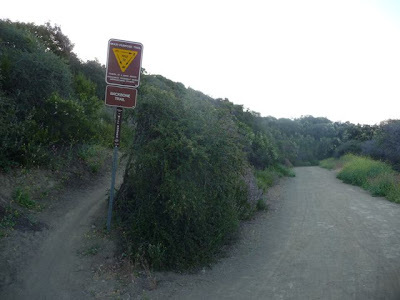 Directions to the trailhead: take the Pacific Coast Highway to Sunset Blvd (in Pacific Palisades) and turn north. 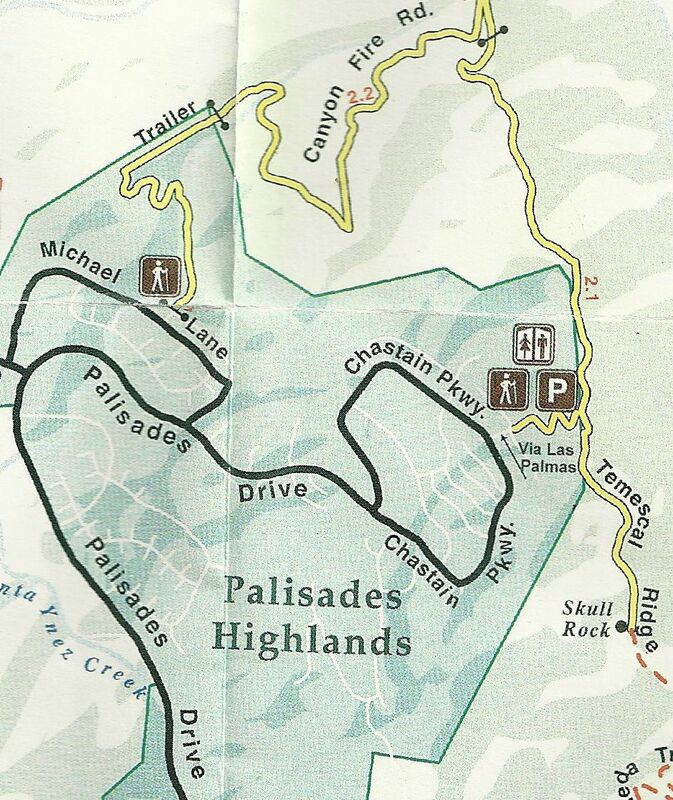 Continue four blocks up Sunset and turn LEFT at the 2nd light: Palisades Drive. 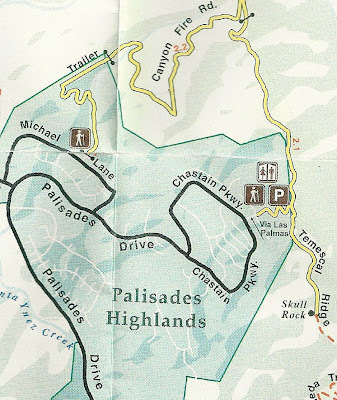 Continue up Palisades Drive 2 1/2 miles pass a traffic light and continue another 1 1/2 as it curves to the left and becomes Chastain Parkway. At the 2nd stop sign you'll be at Via Las Palmas and turn RIGHT at the Via Las Palmas. Via Las Palmas is technically a "private" street - but with public access to the trail head. Continue up Via Las Palmas one block around a traffic circle and continue another short block to the parking lot. There is a parking lot, a bathroom, and a drinking fountain at the trailhead. Walk across the street and follow the paved trail, which becomes a dirt trail after about 1/8 of a mile. Continue to the ridge where you can either turn left (north) and enjoy the hike I took, or turn right (south) to Skull Rock - and eventually back to Sunset Blvd. Hi David, Welcome to the club of those who have clocked a half century. It's not so bad over the hill ... Enjoy the view of what God has done over fifty years and trust Him to do even greater things in the years to come. Beautiful pictures from this hike, Dave! God was showing off that day! BTW A lady just joined my Chinese class this morning from the Palisades. Small world! !